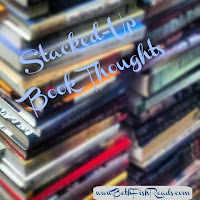 Stacked-Up Book Thoughts are my random notes about books I've read, movies I've watched, books I'm looking forward to, and events I hope to get to. It's almost April, and that means my busy editing season is winding down, and I'm back to regular full-time hours. Phew. I swear if it weren't for audiobooks, I'd hardly read at all during the first quarter of the year. Spring also means it's time to get thinking about BookExpo America, the major book event of the year and one that I look forward to every year. Need even more book fun? If you live in or around New York, I encourage you to attend Random House's second open house. I really enjoyed the December event, and I know the May open house is going to be great. Finally, if you don't know about Bloggers Recommend, owned and run by Jen of Devourer of Books and Nicole of Linus's Blanket, then I encourage you to check out the site. Here's where to find the books your fellow bloggers just can't stop talking about. If you've fallen in love a new release and want to tell the world, please submit a blurb to the site by filling out the provided form. I am so honored to have been chosen to be a founding member of the advisory board. Because my print reading is so skimpy in February and March, I have posted reviews of most of the books I've listened to for both my personal reading and for AudioFile Magazine. One book I reviewed for AudioFile that I whole-heartedly recommend is Travels with Epicurus by Daniel Klein. It's a charming look at embracing the privileges of aging and enjoying a slower pace. 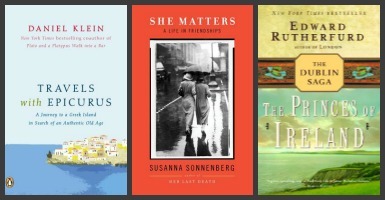 Over at the SheKnows Book Lounge I featured four good listens to celebrate International Friendship Month and three that tie into Irish-American Month. I've been continuing along in my spring graphic novel/memoir kick, so look for some more reviews coming up. I'll write about one new title on Saturday (it's a surprise for now), and hope to get a review for The Unwritten: Inside Man by Mike Carey and Peter Gross posted soon. I'm also enjoying This Close, a story collection by Jessica Francis Kane. I just love her characters. I've written about some excellent biographies and memoirs for the SheKnows Book Lounge, including Russ Mark Federman's Russ & Daughters, a must for New Yorkers and foodies, and Days That I'll Remember by Jonathan Cott, about John Lennon and Yoko Ono. We haven't been watching very much on television lately. 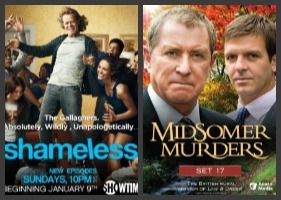 We still like Shameless on Showtime and we've been trying to finish up the Midsomer Murders series on DVD. We're looking forward to the spring shows on PBS, HBO, and Showtime. 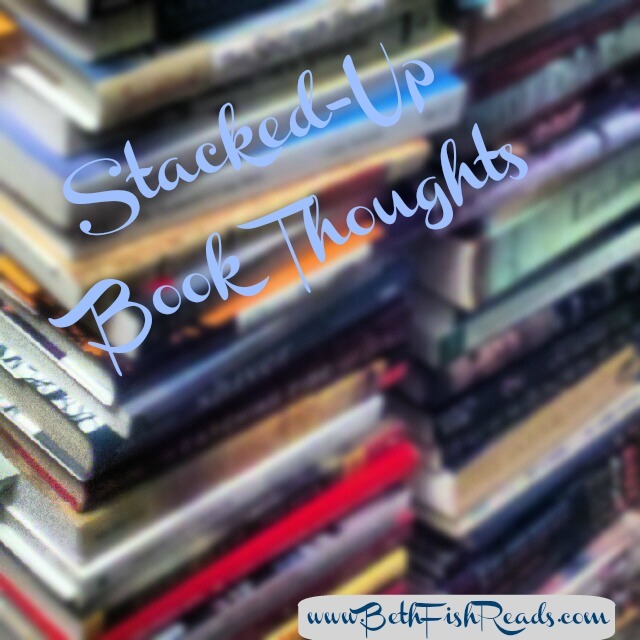 Besides the wonderful books you'll find featured for Imprint Friday, I have the following March books near the top of stack. Although I have no dreams of becoming a writer (I love editing way too much), I've been looking forward to Natalie Goldberg's The True Secret of Writing: Connecting Life with Language, which outlines her ideas on writing and life. I've really liked the first two Camilla Lackberg novels and can't wait to read The Stonecutter, which is part of her Swedish mystery series. I've heard wonderful things about Elizabeth Graver's The End of the Point, which is about family and place over the course of four generations. Finally, A Natural History of Dragons: A Memoir by Lady Trent, written by Marie Brennan has caught my attention. I'm not sure how to describe it in three words, so I won't try. What's on your read, watch, listen, or review list? Glad your busy season is winding down... I'm keeping my fingers crossed for BEA! Audiobooks have been my saving grace here lately too. I'm very interested in Days That I'll Remember so I need to check that review out. So many things going on right now, and you are in the center of all of them! So cool that you can manage to handle so much at one time, and it looks like you are reading such good books. I am thinking of taking a turn towards graphic novels as well. They might be just my speed right now. I need to get this organized since BEA is rapidly approaching. There are a lot of great links here! Thanks for sharing them. It's funny. I adore editing, but I love writing way too much not to. :) Tweeted! Have a great weekend. I just bought my ticket to Random's Open House. The last one was so terrific, and it was good to see you there. I am loving Bloggers Recommend, it is so well done and eye pleasing. It's great to have all those quick recaps of upcoming books. Looks like you've got some great reads...Natalie Goldberg's The True Secret of Writing: Connecting Life with Language, which outlines her ideas on writing and life and the yoko ono and john lennon books appeal to me. Have a great weekend. Book Bloggers Recommend is such a great idea. I haven't been reading too many books that haven't been released yet, which is why I haven't submitted anything yet. We just got the Russ&Daughters book at the store where I work, and I'm really enjoying reading through it a few pages at a time. Pairs really well with the Mile End cookbook!